The Alpha Jet is a small tandem seat twin-engined jet trainer and light attack aircraft designed by the Franco-German collaboration between Dassault and Dornier. 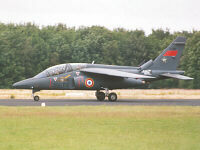 Alpha Jet E was the trainer version originally designed for the French ArmÃ©e de l'Air advanced jet training requirement. The aircraft features a DEFA 30mm cannon. Alpha Jet A was the light attack variant for the Luftwaffe designed to replace the Fiat G.91R/3s in the light attack and close air support role. The A is therefore equipped with a more advanced nav/attack system including HUD, Doppler navigation radar and twin-gyro INS. The German versions were equipped with a 27mm Mauser cannon, replacing the French DEFA. Alternatively a Super Cyclone recce pod could be carried on the centreline station. Alpha Jet MS1 were the licensed built trainers for the Egyptian Air Force, which were followed by the MS2 a light attack/training version. 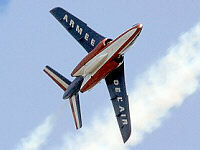 After the MS2 a third generation Alpha Jet was developed, known as the Alpha Jet 3. 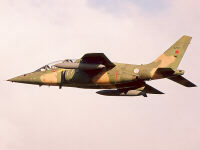 Two variants are reported of the Alpha Jet 3, the Lancier light attack variant and the Advanced Training System (ATS) with two MFD in each cockpit. However some sources report them as being one and the same.